I'm 62 yrs old and have camped since I was a kid. Like a lot of folks we started out with tents and then my parents bought a travel trailer and over the years they progressed up to a motor home. I also have owned a couple of pups and several travel trailers. So I'm not new to the RV world. I was pretty upset with myself when I made a "rookie" mistake and purchased a 5'er that after weighing the trailer when loaded for camping it exceeds my truck's GVWR. I knew the numbers would be close, but that pin weight just climbed up there a lot more than I thought it would after loading up the 5'er. I should have known better. You can see all my numbers in the first pic below. I thought about maybe some helper springs, but I guess no matter what I will still be over my GVWR. So now I'm looking around my area for a used F-350 that will fit my budget as well as my wants and needs. So far I haven't found too many and most have been DRW's. I'm not ruling them out, but I prefer a SWR. Now I know that most of you have heard this story many times, as have I. 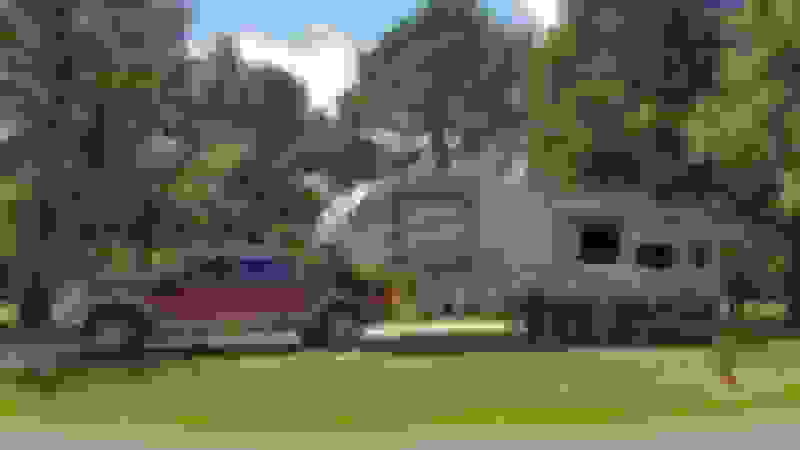 Just thought I would post it just in case anyone thinking about buying their first camper stumbles across this thread. 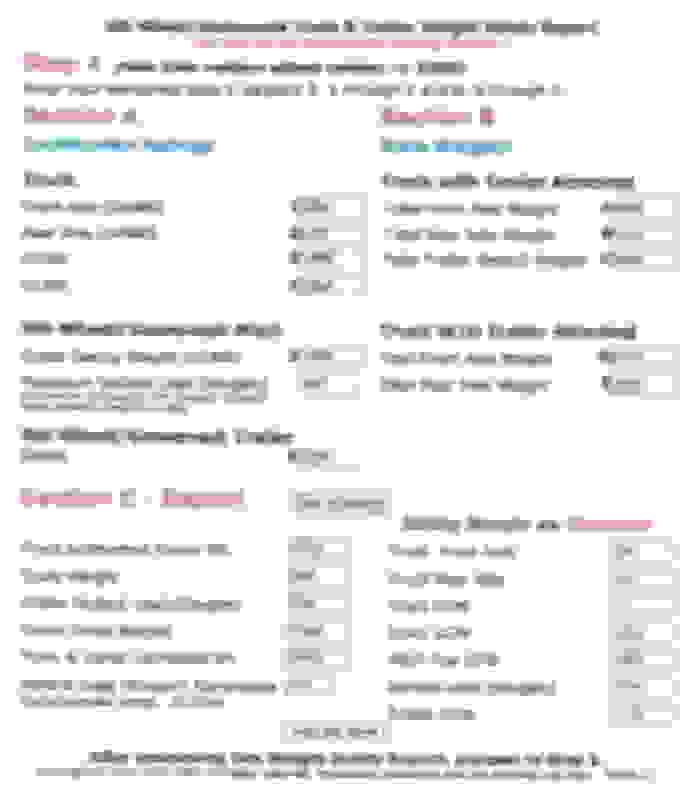 I seem to be one of the only people (besides you) out there that spent a lot of time agonizing over GVWR, GCWR, and GAWR. We are a 2005 F-350 CC SB PS 6.0. Even the same color as yours! Except, with the F-350 we got the 11.4k GVWR and the all important 7K RGAWR. Last Cat scale I was at I was at 23100 GCWR (technically over our 23000 GCWR from Ford) but only at 6850LB GAWR on the back with a full tank, lady and dog loaded, and 11.2K GVWR. We have been living full time on the road for the last 4-5 months since we weighed so I am almost positive that we are heavier, to say nothing of the new 50 gallon Titan Tank - AMAZING BTW. Get one. you wont regret it. Except for the 160lbs its add to your rear axle. This is tricky business for sure! I'm not sure we'll ever get stopped or weighed by the law (primarily RV in the West), but its important for my own peace of mind that we are legal and within Ford spec. My gut feeling from several hard months of researching before buying our F-350 was most people don't notice/care/and pull whatever the heck the truck can tow down the road at highway speeds. Even the Dealer told me not to worry about it - the truck would tow whatever I throw at it. and my gut feeling this is true - this truck, especially in dually form, really has some impressive capabilities. It tows our 15k lb trailer with easy and aplomb...when its not in the shop. That said, in my experience, keeping things within manufacturer spec is the key to reliable and long operation. In the end I probably should have gotten a longbed, and probably a dually. Oh well. Good luck and happy searching for a F-350! Get a long bed...for the fuel capacity if nothing else. I went over the numbers quite a bit before I bought the trailer. What really surprised me was the dry pin weight was listed at just under 20% which seemed normal. After weighing the loaded trailer it went up to over 23%. I believe this is due to how I load the trailer. It's a rear living floorplan with only the fridge and some overhead storage behind the trailer axles. Lawn chairs, tools and other heavy stuff get loaded in the basement and forward compartment. I believe most of that weight goes to the pin. We just got home today from a 3 night, 234 mile round trip with the 5'er. The truck did fine. Like I said, power wise it's not a problem. The wind was up a little when we started out and I could feel it some, but I didn't notice any sway in my mirrors. I know there are a lot of guys that will say my truck can handle this weight and I won't argue that with them. It's knowing that if I have any kind of failure it won't be due to me overloading the truck. Getting a dually is tempting. One should handle my trailer without problems. I hesitate due to driving around town, parking and the added expense of 6 tires vs 4. Besides, an F-350 SWR with a 11,500 GVWR would also handle my trailer. I'm in no hurry to buy. I'll keep looking until I find the right deal. We have no plans for a long trip and probably only one more about 150 miles round trip before we winterize the trailer. I think peace of mind is something that is hard to capture by numbers on a sheet of paper, which is why this discussion comes up so often in this forum. Lots of difference viewpoints and in the end everyone has to decide what is comfortable for them. Everyone has a reason for what they do, good or bad. Running a shorter fiver, our dually is hardly loaded, but that is the way I intended it to be. 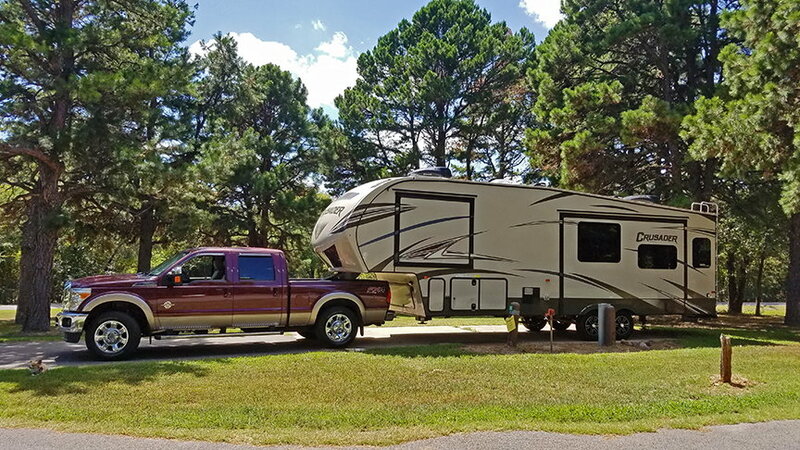 It is my comfort level that is important to me whether it is the truck we run, the tires we choose, or which RV we buy. Some might say good decision, some might say bad decision, but in the end the only decision that is important is the one I make! Am I reading this right? 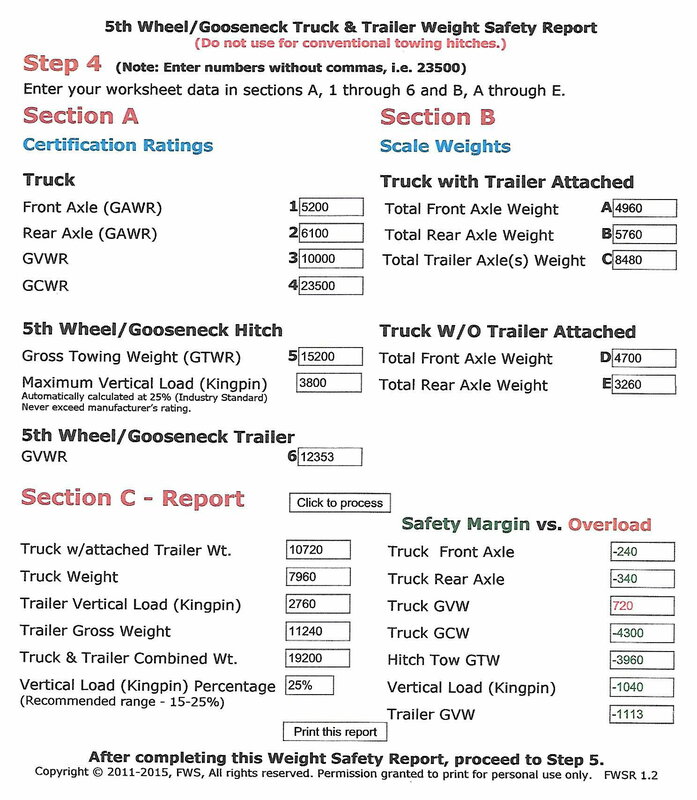 Your truck's GVW is 10,000 and it weighs 4700 + 3260 = 7960 (front axle + rear axle). So it has a total available payload of 10,000 - 7960 = 2040 lbs. I don't see any after market stuff hanging on your truck (except the running boards). Was your truck full of people when you weighed it? I've seen it before and it drives me bonkers that trucks are made with whopper powerful engines but as soon as the people climb inside the cab, you can't tow anything because you're near the GVW. (I'm guessing you were the only person in the truck at the weigh station.) Four average passengers would add 600 to 800 lbs which allows you to tow roughly a 7200 lb fifth wheel. I made the rookie mistake and listened to the salesman when I bought the Raptor! One trip, 3000 miles, and I knew that the capacity of the rear tires were at max!!! I could keep the rig level with the airbags, but this did nothing for peace of mind. I traded the 250 for a DRW 350 and have not looked back! The first trip with the dually, I was bucking winds thagt would have made it a white knuckle experience with the SRW, and all I did was set the cruise and go!! It's borderline "tongue in cheek" advertising too. To say a truck has a GCWR of 23,500 lbs knowing you need 15 - 25% pin weight and there's no way the truck has the payload capacity to handle it. To get anywhere near max towing you need an empty bed and no passengers. Unless I am reading your report incorrectly, I don't see a huge problem, other than being +720 on trucks GVWR, you are under on everything else. Were you and family in the truck on the scales? Not a big deal, but this is how I learned. Depends on how you report it. 720 lbs is a small amount in the grand scheme. On the other hand, it's 35% over the truck's rated payload capacity. Add a couple adult passengers and you're easily 50% over the payload capacity. It's ridiculous that such a heavy truck is rated to carry so little payload. Yea, this topic gets a lot of discussion. It's been said that the 10K GVWR is mainly for those states that treat trucks heavier than that as commercial. It's known that the trucks are the same as F350 SRW. What is important is to not exceed GAWR's both front and rear. There's only one RED number in his report, all the negative numbers look like a good thing to me. Am I reading it wrong? No, your reading it correctly. The only after market items I have on the truck are the Timbrens. It is a fully loaded Lariat with the FX4 package. I guess all that adds a lot of weight. When weighed for camping I was fully loaded with people (just my wife and me) and cargo in the truck (less than 50 lbs) and trailer with 3/4 tank of fuel. As pointed out, I'm 35% over my truck's GVWR and to be honest if it was 10% or less I wouldn't have posted this info. ll other numbers are good and my tires are also rated more than the loaded weight. No, You are not 35% over the GVWR. You are 35% over the calculated payload of 2040, your actual payload of 2760. (2760/2040). You are 7.2% over GVWR. (10720/10000), and just under the axle weight ratings which is good. As others have said, peace/comfort is something to allow you to sleep at night, so that's important. Legal issues aside, I'd drive the OP's rig and never think twice....the truck is way more than capable....it just ain't rated for it. I honestly don't know the legal issues, if any. It's hard to get a black and white answer with the patch work of laws across the states. Does gross weight matter? Or is individual axles more important? I never drove commercial, but my dad drove commercial dump truck for a while and for him the answer was "both". If a good F350 can be found with little damage to the wallet, then that would leave no questions.